Approx 2 1/4" drop, 1" wide, on an adjustable leather cord. 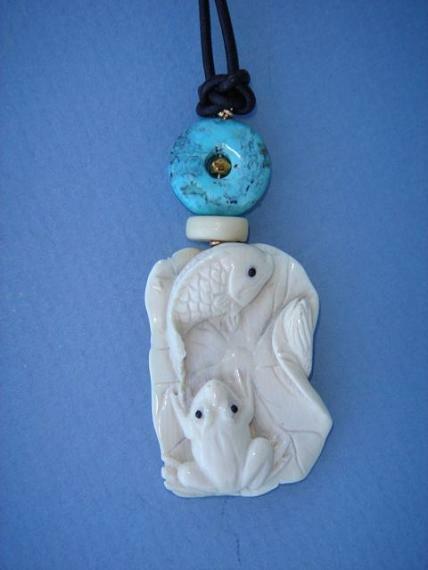 The fish is symbolic of abundance, prosperity, wealth and persistence. It is also believed to represent an advantage in business. The frog, or heavenly chicken, is symbolic of happiness, good luck, longevity and prosperity. The frog is believed to promote pleasant dreams. Is an emblem of spring and abundant rain. It is symbolic of prosperity, happiness, good luck and fertility.